With the options available for lawn mowers, it can become a bit overwhelming. However, battery operated lawn mowers are quite popular and if you would like to make use of it, the information is out there to help you decide. As with any product there are advantages and disadvantages, so it is for battery operated lawn mowers. If these points are of serious concern to you then a battery operated lawn mower may just be the right choice, but guess what? There are more things you must take into consideration, for instance, the size of your yard, how high you let your grass grow in between mowing, the type of grass you have and whether or not you are willing to pause during mowing for recharge of your battery or purchase an extra battery to have on hand while mowing. Depending on your responses to these concerns, you may or may not end up saving money when purchasing a battery operated lawn mower. However when comparing the cost for gas, oil changes and tuning for a non-battery operated lawn mower, versus what you will pay for one battery the cost tends to be even, bearing in mind that you would have to take good care of the battery during the time you have it. Following the instruction manual and the manufacturers guide should help with this. The wheels on the mower can be adjusted with one lever. This is a lot easier than working one each wheel itself. Some of the older battery operated lawn mowers have mechanisms for adjusting each wheel by itself. However adjusting all the wheels at once should now be a standard feature of mowers. Easy operation is a given. For most, you turn a switch, insert a key or press a button to get the motor started and once you release the handle the mower stops. Then you simply repeat the starting steps to get going once more. The option for discharge of clippings is left up to you. Storage, though harder than it would be for a reel lawn mower, is much easier than it would be for a gas operated mower because the majority of mowers fold in on themselves allowing for compact storage. The majority of these mowers will have a gauge to show how much power is left in the battery. If you have timed and played your cards right, then hopefully you shouldn’t be left with no battery and a half mowed yard. These best battery lawn mowers should give you all you wish for and more. Black & Decker has become a household name for many appliances and various items related to home maintenance and the like so it should not come as a surprise to anyone that they also manufacture lawn mowers. Their cordless self-propelled lawn mower with removable battery delivers an accurate and clean cut without the mess and hassle of gas, oil changes or regular tune ups. This is not to say that this Black & Decker mower will not need maintenance. Indeed that is not the case, but, following the manufacturers guide and manual on how to care for and maintain your battery powered mower will be the best option that you have. The 36 Volt removable battery lifts out to charge anywhere and gives an instant start with the push of a button. There is a variable speed self-propelled system which adjusts to your ideal mowing pace. The self-propelled function is being hailed as one of the best features of this mower. Without this function, the weight of the mower makes it harder for individuals with less strength to use if efficiently and so this feature is definitely a winner. This mower adjusts easily and can be folded for compact storage. It is not gas powered and so creates no emissions, so is essentially environmentally friendly. When you purchase this product the box will contain the lawn mower, charger, rear bag assembly and safety key. As the customer, you have the Black and Decker guarantee that this best battery lawn mower will help you work smarter, faster and cleaner without compromises. #2 Choice – GreenWorks 25302 Twin Force G-MAX 40V Li-Ion 20-Inch Cordless Lawn Mower with 2 Batteries and a Charger Inc. This GreenWorks lawn mower is a complete system. It comes with two batteries and a charger and powers multiple tools for complete yard work. It is ideal for midsized areas, and its innovative Smart Cut technology adjusts for power or runtime based on the thickness of your grass. It carries dual blades which offer better cut quality, superior mulching and bagging capabilities and an automatic battery switchover pulls power from the second battery once the first is depleted. This lawn mower is one that anyone can use. It is lightweight, operates quietly, easy push button to start and promises seventy minutes of run time on a single charge. It is not a self-propelled mower so you will have to put in effort when navigating the lawn. Despite that fact, this mower provides you with an easy and fulfilling mowing experience and is easily maintained once you follow the instructions in the manual that come with the mower. This GreenWorks 25302 Twin Force G-MAX 40V Li-Ion 20-Inch Cordless Lawn Mower with 2 Batteries and a Charger Inc. is ideal for anyone looking for a great mower from a company committed to providing excellent products what will benefit and not harm the environment. This lawn mower is known for its ergonomic and handiness mowing technology that is capable of cutting through tough grass, mulching thoroughly then bagging the shredded pieces and discharge them finely. It also has a special mulching blade that chops up clippings better than standard blades. It cuts up to 6,000 square feet on a single charge which gives you approximately thirty minutes of runtime. The WORX WG775 promises to take the chore out of mowing. The 3 in 1 mower that easily starts at a push of a button has a cutting width of 15.8″ and a cutting height of .8 to 2.75″. This way you will preserve the life of your mower by using the recommended settings in the recommended conditions. This mower is designed for small yards. If generally it takes more than an hour to mow your lawn, then anticipate having to pause in your mowing to recharge the battery. This mower has versatile discharge options and discharges grass according to your needs and how you have set it up on the mower. 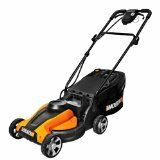 This best battery lawn mower like the other two mentioned, can be stored in small spaces and offers quick adjustments so that you can mow short or tall grass blades depending on the situation. The handle of this mower is padded with upswept handle reduces fatigue and improves control for a comfortable grip and this mower carries a manufacturer’s limited warranty.